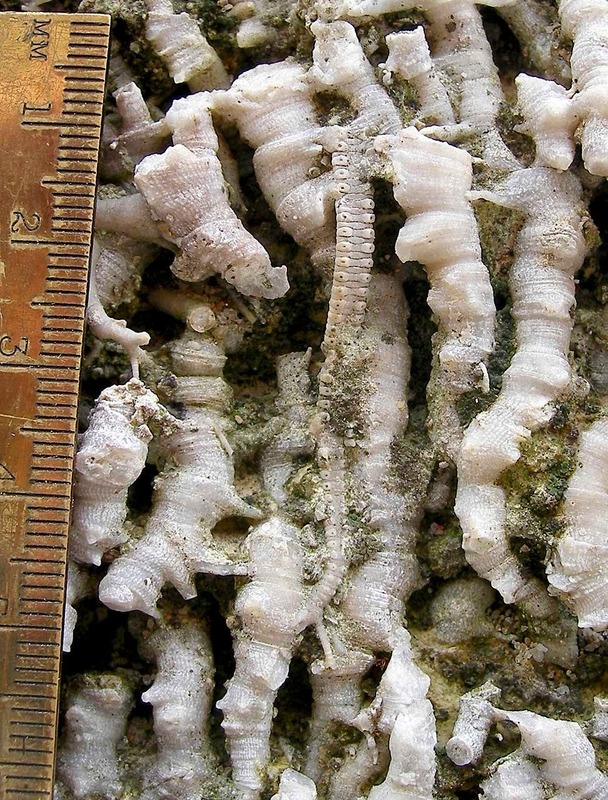 This picture shows very small crinoid fossil attached to a larger colonial coral fossil. It was found in the Louisville Limestone of Jefferson County, Kentucky USA. The crinoid fossil appears to be a Myelodactylus. The colonial coral might be an Entelophyllum rugosum?. They existed in the Silurian Period. Visit the Falls of the Ohio State Park web site for some example pictures of the Myelodactylus crinoid (scroll down toward the bottom of the page). Consult Erwin Stumm's 1964 book Silurian and Devonian Corals of the Falls of the Ohio page 32 and plate 22, figures 9-13 (pages 112-113) for more information about the coral fossil. Thanks to Kenny for the picture of this nice fossil.